India needs to tweak its legal regulatory system on the lines of countries like Canada and Netherlands to establish newer categories of medicinal products derived from Cannabis, and expand the interpretation and definition of cannabis and its by-products so that cannabis-based medicines become more widely available. 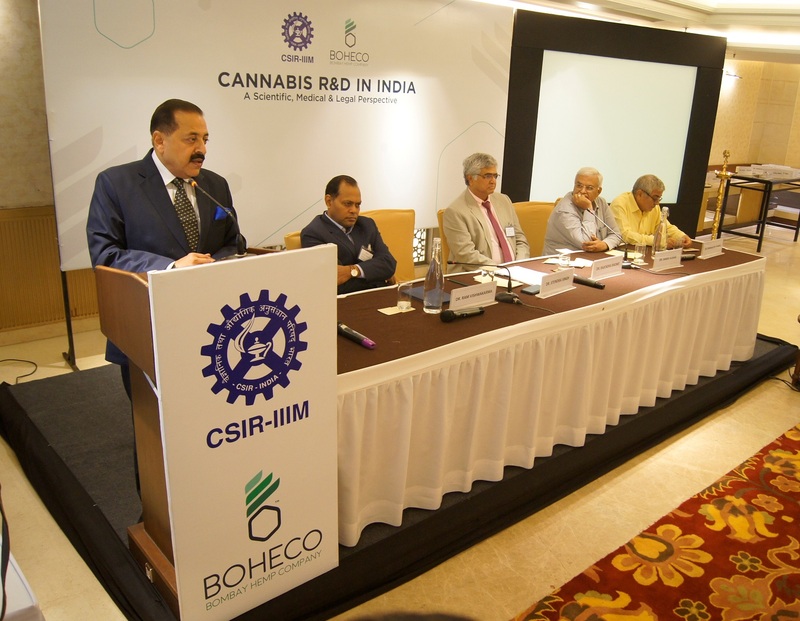 This was said by experts at a conference titled “Cannabis R&D in India: A Scientific, Medical & Legal Perspective,” jointly organized by the Bombay Hemp Company (BOHECO) and the Council of Scientific and Industrial Research (CSIR) — Indian Institute of Integrative Medicine (IIIM). The day-long conference saw participation of prominent medical experts, policy makers and researchers, including Dr. Jitendra Singh, Minister of State for Prime Minister’s Office; Dr. Ram Vishwakarma, Director – CSIR-IIIM; Dr. Rajendra Badwe, Director, Tata Memorial Centre, Mumbai; Dr. Dharamvira Gandhi, Member of Parliament (Lok Sabha);Dr. Rajender Pal Singh, Former DDG (North Zone), Narcotics Control Bureau; Dr. Sanjay Kumar, Director, CSIR-Institute of Himalayan Bio-resource Technology; Dr. Manjari Tripathi, Head (Neurology), All India Institute of Medical Sciences; Dr. Anurag Srivastava,Head (Surgery), All India Institute of Medical Sciences; and Jahan Peston Jamas, Co-founder, Bombay Hemp Company. Speaking at the conference, experts said that India lacks three very important aspects to bring it up to the level of Western nations in terms of cannabis-based medicines. These include non-availability of standard cannabis varieties or strains which will have predictable outputs; negligible clinical research on cannabis due to lack of standard material; and absence of standard product development from standard cannabis varieties. They asked Indian Government to provide support on the plant-breeding side of cannabis ecosystem, as standard cannabis has not been bred in India since 1985. The panelists recounted several myths surrounding cannabis-based medicinal products. These include the myth that synthetic cannabinoid based medicines have greater efficacy, predictability and safety, compared to -based cannabinoids. They said that it is wrong to think that the major method for ingestion and consumption of cannabis-based medicine is through smoking. In fact, there are multiple forms of administration of cannabis with considerably lesser health risks, such as capsules, oils, tinctures, patches, sub-lingual sprays and vaporizers. Experts felt that the cannabis plant is a victim of misperception despite being an integral part of Indian culture. For thousands of years, it has been a trusted ingredient in the treatment of various ailments. Yet cannabis is mired in ambiguity when it comes to its application in modern healthcare.